To be honest, I doubt Su-33 will serve that long to see a new carrier with catapult. They will serve on Kuznetsov, but in small number, majority will be new MiG-29K. MiGs are now well used in Yeysk training center to train pilots for carrier operations. I still think majority of Su-33 will serve from ground airbases in north for over sea patrols as they are the best for this job. They have long range, anti-corosion protection, naval navigation equipment to fly over sea, IFR, stronger undercarriage for carrier operations and after all, folding wings, so it will take less space in hangars in far north Arctic bases as smaller hangars are better for warming. They will be of good use to protect warm sea door to Arctic naval route from Atlantic to Pacific. From ground airbases they could serve for quite a long time, considering they produce new engines for them, because ground airbase operations are far less stressful for plane than carrier operations. In contrast to US carrier fighters, Su-33 didn't have many hours on carrier as Kuznetsov was rarely on the sea and never with full group. They could still serve for 20+ years. medo wrote: To be honest, I doubt Su-33 will serve that long to see a new carrier with catapult. They will serve on Kuznetsov, but in small number, majority will be new MiG-29K. MiGs are now well used in Yeysk training center to train pilots for carrier operations. I still think majority of Su-33 will serve from ground airbases in north for over sea patrols as they are the best for this job. They have long range, anti-corosion protection, naval navigation equipment to fly over sea, IFR, stronger undercarriage for carrier operations and after all, folding wings, so it will take less space in hangars in far north Arctic bases as smaller hangars are better for warming. They will be of good use to protect warm sea door to Arctic naval route from Atlantic to Pacific. From ground airbases they could serve for quite a long time, considering they produce new engines for them, because ground airbase operations are far less stressful for plane than carrier operations. In contrast to US carrier fighters, Su-33 didn't have many hours on carrier as Kuznetsov was rarely on the sea and never with full group. They could still serve for 20+ years. The Su-33s are still flown from land bases for training, they have plenty of hours on them. They should be on their way out for MiG-29K. Su-33 will leave Kuznetsov deck to MiG-29K, but they will be still used from land airbases. Su-33 are of the youngest Flankers build in the nineties. They are naval carrier based jets. They have enforced structure for carrier operations, they have better anti corosion protection and they have lower G limitation because of folding wings and they never carry full combat load. Their land operation were even less stressful than for standard Su-27. Just look at Iranian F-14A. Su-33 could serve for quite a long time as land based fighter with good maintenance and new engines. They are worth to be modernized as they have their own theatre of operations, for which they are better suited than any land based fighter. medo wrote: Su-33 will leave Kuznetsov deck to MiG-29K, but they will be still used from land airbases. Su-33 are of the youngest Flankers build in the nineties. They are naval carrier based jets. They have enforced structure for carrier operations, they have better anti corosion protection and they have lower G limitation because of folding wings and they never carry full combat load. Their land operation were even less stressful than for standard Su-27. Just look at Iranian F-14A. Su-33 could serve for quite a long time as land based fighter with good maintenance and new engines. They are worth to be modernized as they have their own theatre of operations, for which they are better suited than any land based fighter. They are outdated. Their huge rcs makes it an easy target for any new fighter. Not more than any other 4th gen fighter jet and they will still serve for decades. It have the same rcs as Su-27 and could be treated the same way to lower it. Su-33 will not be that easy target. They will be integrated in Russian IADS with excellent radar network incliding OTH radars, AWACS planes and MiG-31BMs in high altitude. New ECM pods and Pastel RWR will deny AMRAAM attacks and armed with new R-77-1 and R-74 missiles is quite equal to any new fighter. SU-33 have IFDL as standard equippment and with SVP-24-33 they got newer data link communications, so they are well networked and have good area awareness and could exchange picture with others. In anti-ship role armed with Kh-31AD or Kh-35U they could attack ships from safe distance. Also it will be in Arctic region, where are not that many fighters around. Without extensive upgrades, any 4th generation fighter is outdated. Some su-33 received SVP-24 because it was a cheap upgrade which means they don't want to modernize them heavily. The canards add rcs so it has a bigger rcs than any other flanker. They should try to sell them to Argentina or Iran or any air force that needs quick fighters and buy su-57 instead. It's not by upgrading a handfull of 4th generation fighter that they will have a powerfull air force. Russian generals said they need like 250 su-57 and 300 mig-35. Not 12 du-33 upgraded. Air Force and NAVY are very different branches of armed forces. Su-30MKI/MKM/MKA/SM have canards as well and they are also twin seaters. Su-33 is still inside Flanker family. Su-33 got quick SVP-24 upgrade for their combat action in Syria. Their experience in Syria was positive, that is why they decided to restart production of modernized AL-31F3 engines with lower fuel consuption and longer service life and to modernize the fleet. Air force have their own job to do and they need hundreds of Su-30SM, Su-34, Su-35, Su-57 and MiG-35 fighters. Navy have their own job to do and they got new SU-30SM for land airbase operations in the size of a squadron per fleet and they got a regiment of MiG-29K for Kuznetsov carrier. Modernized Su-33 is more effective than MiG-29K simply it have longer range and bigger combat load. N001VP1 radar is more capable than Zhuk-M.
Arctic region is not under Army or Air Force jurisdiction, but under Northern Fleet command. Northern fleet is also receiving their Su-30SM to replace Su-24 and Su-27 fighters for naval bases protection and near sea defense. But for long range over the sea flights Su-33 is far better suited, because it have special anti corosion protection and special naval navigation complex. NAVY dosn't need hundreds of SU-33, existing regiment is enough to do their job in given area. Land based navy fighters can be replaced by air force. At the end it is still russian army that buy modernization for su-33 so less money for air force. Su-33 is far better suited, because it have special anti corrosion protection and special naval navigation complex. At the end it is still russian army that buy modernization for su-33 so less money for air force. Their special naval navigation complex is for moving carrier ops., it's not needed for stationary Arctic islands ops. But I agree that they can augment the SU-30SMs & keep their pilots in the air w/o the Adm.K. The Land Forces don't pay for modernization for SU-33s, perhaps u mean the entire Armed Forces budget? In any case, a dozen of them isn't worth "deep modernization". Exactly this is the difference. Land base fighters are there for protection of naval bases and for flying in near sea area, that they could operate with land based RSBN navigation beacons. Su-33 on the sea dosn't work with RSBN as it is not there and they still fly too far away to operate only with navigation beacon from carrier. So they have to use navigation beacons from other ships or from navigation buoys. Of course SATNAV work globaly, but satelitte signal could be jammed, so they need this kind of radio navigation for long range over the sea flights as a back up. When they are stationd on those far away Arctic islands, they will have to fly in long range over the sea patrols. Of course they Will have RSBN complexes installed on those islands, but still they Will mostly fly over sea, not over islands. SVP-24 only allows an aircraft carrying several tonnes of small bombs the ability to hit one target by saturation. It is cheaper to carry one LGB or electro-optical that costs less than all of those dumb bombs. Su-33 taking off from a carrier could not carry enough payload to haul all of those bombs to use it. medo wrote: When they are stationed on those far away Arctic islands, they will have to fly in long range over the sea patrols. Of course they will not be constantly in the air. RuMoD planes to station 4 fighters in Zemlya Aleksandra island together with air refueling tanker and few helicopters in all year operational air base. Their working area will be between Franz Joseph islands, Novaya Zemlja island and Severnaya Zemlya islands. Of course in peacetime there is no need for constant long range patrols, but sometimes they will have to check spy planes and ships near Russian interest area. RuMoD planes to station 4 fighters in Zemlya Aleksandra island together with air refueling tanker and few helicopters in all year operational air base. If true, will they rotate them in & out of there? If not, what will they do with the remaining 8 SU-33s? Russia added a new fleet of Su-33 fighter jets Monday to its growing military contingent in the Arctic, a Russian naval spokesman said. 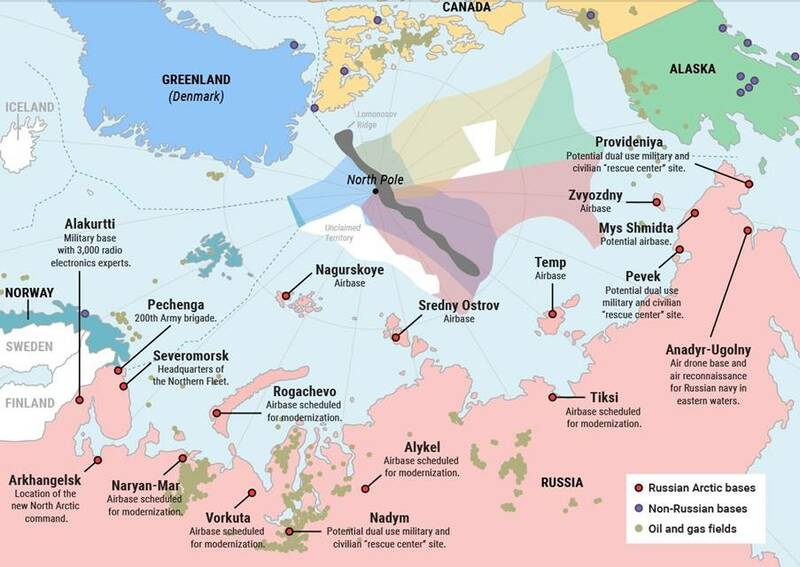 The Kremlin has spent the last several months bolstering its presence in the resource-rich polar region, despite repeated NATO criticism. The unspecified number of Su-33 navy flankers will function as air defense units for the military in the Arctic, Russian agency Sputnik International News reported. The aircraft were previously used to defend the Northern Fleet ships on long excursions. “Pilots of the shipborne fighter aviation regiment of the Northern Fleet have begun service guarding the air borders of the Kola Arctic region using the deck-based Su-33 fighter jet – the naval equivalent of the multi-role Su-27 fighter jet,” a spokesman for Russia’s Northern Fleet said in a statement. The Su-33 can operate from aircraft carriers and was designed as an air-to-air fighter. This is from three years ago. They start their dity in Kola region air defense, but with rebuilding Arctic air bases, they could serve in other bases as well. MiG-29K will take the carrier, Su-33 main task is now in Arctic region. Russia have quite a number of Arctic air bases, but limited number of MiG-31BM, which will most probably serve in continental Arctic bases, Far East and in Siberian bases. They could be stationed in Rogachevo air base in Novaya zemlya island as well, but I doubt they will be on other islands. Russia will have whole year air base in Zemlya Aleksandra island with constant group of planes and helicopters and most probably they will rebuild air base in Sredny Ostrov island in Severnaya Zelmya islands, where in Soviet times were Tu-95 bombers and Tu-128 interceptors. Su-33 will have place to serve. All those Arctic islands are under Northern fleet command except Wrangler Island, which is under Pacific fleet comand. today this aircraft "is becoming a multi-role machine." First of all with new carriers with AWACS platforms onboard then nothing reduces RCS like not having to use your own radar. Another aspect is that aircraft never operate alone so one aircraft could be blasing away with a huge powerful radar scanning for targets but passing on that information to 5 other aircraft in the formation... the enemy will see the active aircraft, but how will they know there are five other aircraft there? Equally future advances in radar technology... if claims made today are to be believed, suggest stealth is not going to be that useful in the future with radars becoming rather more effective instruments than they are today. You are not seeing Almaz Antei complaining about Russia selling S-400s to Turkey because Turkey is getting F-35s, but you do see the Americans jumping up and down because Turkey is buying S-400s... are they afraid that their claims of stealth might not measure up to reality? Perhaps American F-35s are going to be stealthy but models sold to international partners wont be and that is the secret they want to hide? Either way a nice big Flanker should be able to carry a rather large powerful radar... if they are not that stealthy anyway they wont mind using it and detected enemy platforms in view... if they were highly stealthy they would avoid trying to use their radar for fear of giving away their location. Of course the Su-33 should be able to carry the external targeting pod carried by the PAK FA which should allow passive targeting on the cheap too. You are not seeing Almaz Antei complaining about Russia selling S-400s to Turkey because Turkey is getting F-35s, but you do see the Americans jumping up and down because Turkey is buying S-400s... are they afraid that their claims of stealth might not measure up to reality? Perhaps American F-35s are going to be stealthy but models sold to international partners wont be and that is the secret they want to hide? The Israeli F-35s r no less stealthy. DAMASCUS, SYRIA (5:35 P.M.) – Up to 25 Russians warships and 30 aircrafts will involve in drill in the Mediterranean Sea on September 1-8, the Russian Ministry of Defense said. “In accordance with the training plan of the Russian Armed Forces, large-scale drills of the grouping of forces (troops) of the Russian Navy and the Aerospace Force will be conducted on September 1-8, 2018 in the Mediterranean Sea under the direction of Navy Commander-in-Chief Admiral Vladimir Korolyov”, the ministry announced. “In the international airspace, training tasks will be practiced by about 30 aircraft, including the strategic Tu-160 missile-carrying bombers, the Tu-142MK and Il-38 anti-submarine warfare planes, Su-33 fighter jets and Su-30SM aircraft of naval aviation”, the ministry added. It seems Su-33 return to Syria for naval drills. Any more informations or pictures for Su-33 in Syria? Did they go through additional upgrades after the first tour in Syria on Kuznetsov? It looks like NAVY more like Su-33 than MiG-29K and this time Su-33 operate from ground airbase, not from carrier. Presence of Su-33 in this exercise and no presence of MiG-29K could indicate, that Su-33 crews are getting ready to take this kind of job over Arctic sea. The E. Med. Sea isn't similar to the Arctic & they could have done their training there. It's to keep their skills honed while the Adm.K is in the yard & add to the # of other fighters in Syria available just in case. We would have heard of any significant upgrades on them by now. Presence of Su-33 in this exercise and no presence of MiG-29K could indicate, that Su-33 crews are getting ready to take this kind of job over Arctic sea. It could be that the Su-33 needs more operational testing... I rather suspect that the MiG got modern testing of new tactics during its more recent development, while the rather older Su-33 was tested and evaluated a lot longer ago, so there are likely more tests to do on it. The MiG-29 they operate was fully multirole from the design inception, whereas the Su-33 was more of an interceptor with very basic unguided air to ground capability with unguided rockets and bombs... pretty much an Su-27P with folding wings and tailhook and structural strengthening... for operations in Syria it would have a variety of roles including interception (drones and any foreign planes that wandered into the wrong place to be escorted back to where they should be) and light bombing, as well as recon missions and perhaps even information gathering... including receiving target information from ground forces and engaging new targets in real time... even just the basics of mission planning and execution it is valuable experience. Short video from naval exercise in Mediteranean sea. At 3:40 we could see take off of a pair of Su-33 from Hmeimim air base. A confirmation, that Su-33 are actually there. On the video they carry only Sorbtsia ECM pods and R-73 AAMs.